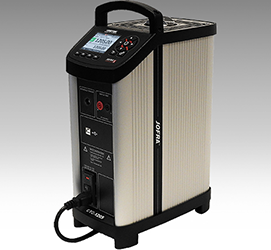 Ametek Sensor, Test & Calibration (STC) has launched its new Jofra CTC-1205 compact temperature calibrator. The calibrator offers improved calibration times over the predecessor CTC-1200 calibrator and is suitable for waste incineration, power plants, oil and gas production. The new Ametek calibrator offers a temperature range of 100° to 1205°C, accuracy of ± 0.2°C, and stability to ± 0.1°C for the total temperature range. The calibrator offers silent mode operation, which provides an improved working climate in laboratory areas, and faster cooling times, down to 45 minutes. MVI (Mains power Variance Immunity) circuitry ensures stability despite mains supply variations. The unit features an intuitive easy-to-use interface, and popular functions, such as automatic switch test and auto stepping, are available with special one-key-one-function buttons. The unique STS reference sensors for the CTC-1205 are “plug ‘n’ play” and ensure full documentation. CTC-1205 calibrators ordered with the reference sensors will include a full system calibration certificate as a standard.